No wonder the only way to “make work pay” is to introduce cuts in benefits. Capped below inflation for the next 3 years; an overall benefit cap related to average pay that will cost 40,000 households, 89% with children, an average of £93 a week; disability living allowance to be taken away from 170,000; council tax rebate cut; the “bedroom tax”; and so on. All these measures are being prepared and brought in very carefully to undermine any working class response. “Vile product of welfare UK” screamed the Mail (3 April), “I think there is a question for government and for society about the welfare state, and the taxpayers who pay for the welfare state, subsidising lifestyles like that …” echoed chancellor George Osborne. This is the most nauseating extreme of the campaign to divide the working class that wants to stir up real hatred against those on benefits, particularly the unemployed, using the tragedy of a couple who set fire to their house killing six children. Have these people never heard of insurance fraud? Of landlords who destroy their property because it’s more profitable to get rid of tenants? Of businesses in Bangladesh where workers are burned or crushed to death when capital cuts corners? Or indeed of businesses in Waco, Texas, or clubs where young people go to dance, where people are tragically, and negligently, killed? The more ‘reasonable’ side of the campaign wants to create a division between the “striving” who go to work and those who are “rewarded” for being unemployed by a “broken system” that traps people on benefits and in poverty. All very reminiscent of Gordon Brown’s “hand up, not hand out” from the early days of the last Labour government, as it brought in the benefit cuts of the time. In fact it is the same argument, and one the Labour Party is still making. For all the criticism by Liam Byrne, shadow work and pensions secretary1, of Tories who “want to play ‘divide and rule’. To distract the public from their failure to get the economy growing and control the rising bill for unemployment”, when push comes to shove, he argues: “First, people must be better off in work than living on benefits. We would make work pay by reintroducing a 10p tax rate and supporting employers who pay the living wage. Second, we would match rights with responsibilities. Labour would ensure that no adult will be able to be live on the dole for over two years and no young person for over a year. They will be offered a real job with real training…. People would have to take this opportunity or lose benefits”. All the politicians of left and right use the same phrases and make the same allegation that unemployment is voluntary. So the Labour Party wants to have its cake and eat it, to divide the working class by allegations of unemployment as a lifestyle choice, and to provide an alternative to the nasty Tories who divide the working class; to ‘make work pay’, and to be fair to those on benefits; to ‘responsibly’ cut the deficit by attacking the working class, as they did in government, and to pose as the workers’ friend. For all the bluster about getting benefits down by getting the unemployed back to work, they and the long term sick only take a minority of benefits. In 2009-10, Job Seekers Allowance (3%), Income Support and Employment and Support Allowance (4% each) only took up 11% of benefits, whereas tax credits (child tax credit 10% plus working tax credit 4%) for people in work took up 14%2. These benefits, as well as other means tested benefits such as housing and council tax benefit, also go to those on low incomes whether or not they are in work. They are used to maintain those on wages permanently below the minimum needed. Far from allowing ourselves to be divided against each other, blaming the unemployed, we need to see that the benefit cuts, like the attacks on those in jobs, are attacks on the whole working class. 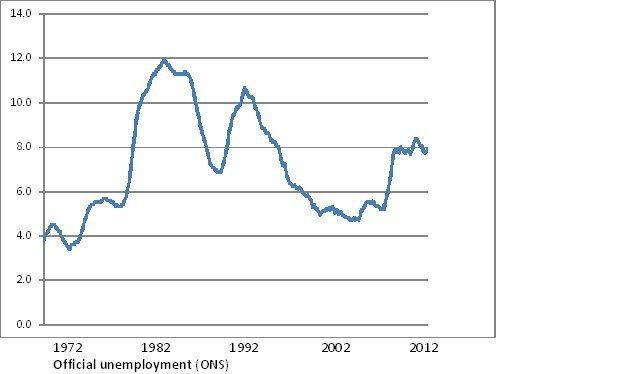 Unemployment in the UK has been counted in the millions since the end of the 1970s, more, often much more, than 1 in 20 of the working population. This was a great shock to the baby boomer generation who were brought up when 1 or 2%, or half a million, out of work was considered high in the 1960s. It’s not that there wasn’t unemployment in the post war decades, but that most of it was in the periphery while Western Europe had a shortage of labour. 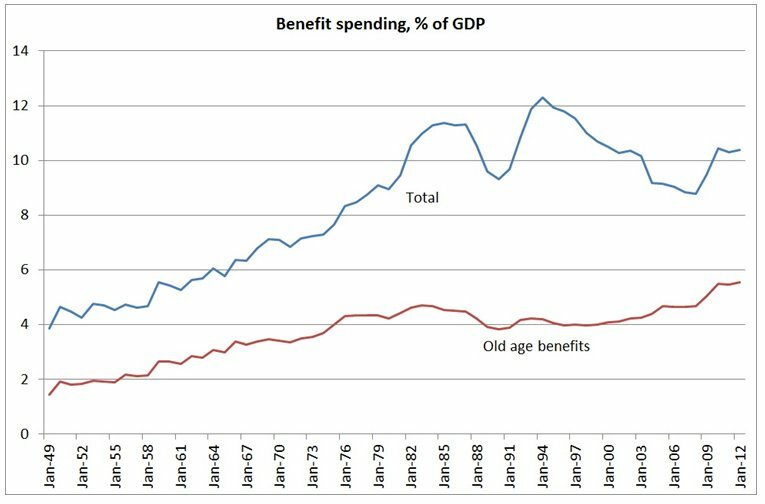 The current figure of 2.56 million unemployed, 7.9%, comes after the statistics have been massaged many times, and particularly after a policy of transferring as many as possible onto incapacity benefit from the late 1980s. So we know that a proportion of the 2 million on long term sickness and the 2.24 million economically inactive are really unemployed. 900,000 have been unemployed for over a year and half of these for over 2 years. 979,000 of the unemployed are age 16-24, giving them an unemployment rate of 21%: a generation blighted. We see a similar picture in other countries. The USA has a similar jobless rate to the UK, and in the Euro area it is 11.9%. So unemployment is a long term international phenomenon, but how is it inevitable? Each capitalist business needs to produce and sell both competitively and at a profit. To do so, and to steal a march on their competitors, they need to produce more cheaply, more with less workers, and when they can’t do this by technical innovation they do it by pushing their employees to work harder or longer, or both. Either way more is produced by fewer workers and the market becomes saturated with products that cannot be sold. Workers are laid off, enterprises close. We saw this with steel and shipbuilding in the 1970s and 1980s and with the car industry more recently. Unemployment goes up and increased competition tends to drive down wages. States that found a welfare system useful in times of labour shortage start to cut, cut and cut again – as we have seen since the 1970s. How long will it last? The mechanisms that allowed capitalism to recover in the 19th century, opening up new markets in new areas of the world, emigration of the ‘surplus’ population to the colonies, no longer exist. China is often hailed as the engine that will get the world economy going again, but its high rates of growth and low wages make it a competitor rather than a market. In the latter decades of the 20th century state intervention has been used, either by nationalisation or by subsidies, but over the last 40 years states have had to pump in more and more money with less and less benefit to the economy. Now debt, and particularly state debt, is one of the key problems in this crisis. Lastly there have been little booms based on speculation, such as the dot.com bubble and the recent subprime housing bubble that burst in 2007-8. Throughout it all unemployment has remained persistently high. Figures for GDP will go up and down but we won’t see any reversal in the general trend of worsening crisis or high unemployment, whatever the politicians promise. This situation makes struggle against the attacks necessary, but extremely difficult. Difficult both because of the threat of unemployment against workers who resist attacks, and because unemployment itself tends to drive down wages. It means constantly fighting against worsening conditions, resisting one attack only to see another pushed through instead, or the same one introduced later, until the working class is able to pose the question of ending capitalist exploitation once and for all. We must begin by rejecting every attempt to divide us up between employed and unemployed, public sector and private sector, born locally or immigrants. The whole working class is under attack and we can only fight back in solidarity with each other. 1. See this Guardian article on benefit cuts. 2. See "Left foot forward"